Fairy Tale Fandom: A Post for Papa Polendina. This post is coming about a week late. Things have just been getting in the way. However, I liked the sentiment enough to do it anyway. This post is for Father's Day, and the various fathers out there. It's not easy to find good fathers (or mothers) in fairy tales. Usually, they're kind of awful. In children's literature, they tend to be absent. The parents take a back seat as the children go on some kind of adventure. But there is one exception. That's right, this one is all about Geppetto! I've said before that the story of Pinocchio is one of the few children's stories that reflects the complicated nature of family, and I stand by that. 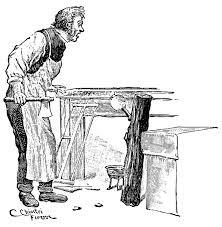 First of all, Geppetto is far from a perfect human being. He's known as being quite a hothead and actually has a reputation for not liking children (generally because he gets angry when they make fun of him for his yellow wig, for which they call him Polendina). However, even in this world in which puppets are alive and could easily be considered the children of their makers, he still sets out to carve one that can dance, fence, turn somersaults and earn him money. Now, it seems a bit mercenary in 2016, but in 19th century Tuscany it hardly seems like a big deal that a child would serve as some kind of support for their aging parent. But then, he has his hands full because he has to take care of Pinocchio. Pinocchio runs away, and because Geppetto's reputation proceeds him, Geppetto ends up being sent to jail as a suspected abuser. He brings pears for Pinocchio's breakfast and Pinocchio refuses to eat them unless they're peeled. And despite this ungrateful turn, he still peels them. He sells his winter coat to get Pinocchio a school primer, and Pinocchio sells it for tickets to see a puppet show. Pinocchio disappears for long periods of time and Geppetto puts his all into finding him, even sailing off in a little boat and getting swallowed by a giant dogfish. 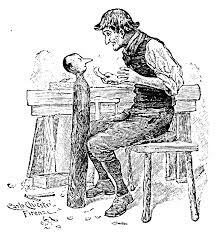 Raising Pinocchio is close to being a thankless job, but Geppetto keeps trying. And trying. And trying. And trying. Though, through Pinocchio's own effort, it does eventually get better. It's here we have to stop and think about just how human our parents actually are. About how much raising children probably comes down to sheer effort. They don't necessarily know all the answers (though we think they do growing up). They probably often have to make things up as they go along. The job can be thankless because children simply expect it of them. It's probably much worse when having to raise a naughty boy like Pinocchio. But when they get older, we do have to admire how much they put into it all. So, here's to Pinocchio's dad! And here's to my dad! And here's to all the other dads out there just trying to make the whole parenting thing work. And to all of you, a Happy (belated) Father's Day!